When should you wash a mushroom? What’s the best way to melt chocolate? What are the rules for melting cheese? How can you tell if a pear is ripe? How can I tell when your hamburg er is ready? 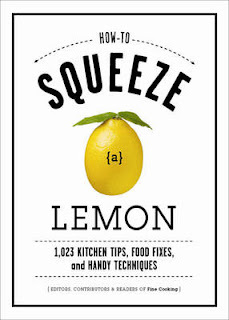 Obviously, I could go on (over a thousand times, as a matter of fact) but How to Squeeze a Lemon (Taunton) is simply the answer book for the contemporary kitchen. The book is a tidy, practical package compiled by the “editors, contributors and readers” of Fine Cooking, one of the most actually useful foodie periodicals available today. How to Squeeze a Lemon is no t a big, glossy production and no photos of any kind have been included. The book is pure information, and rather a lot of it at that. From choosing kitchen equipment to produce; how to stock a pantry; how to perform various techniques; what to know about wine, beer and salad; and what to do when things go wrong. If the contents page won’t get you there, a very good index section will. Monica Stark is a contributing editor of January Magazine. She currently makes her home on a liveaboard boat somewhere in the North Pacific.